Terrorism is forever present and the threat that exists today is no less ominous than it was on that random sunny Tuesday a decade and a half ago when 19 men changed history. And it is not just terrorism. The scale and cruelty of killing ever increases while the fragility of urbanized society makes civilians ever more vulnerable. No country is immune, neither from external nor internal violence. All of this exists despite the backdrop of vastly increased police and security activity and a constant global war, one that has consumed hundreds of billions of dollars and taken countless numbers of lives. No wonder then that those engaged in the fight against terror see the battle as everlasting. And because terrorists hide within civil society, no wonder those charged with security also believe that society must sacrifice liberties and freedoms in order to obtain a modicum of safety. To be as fair as one can be while also having an opinion on the matter, this is as close as I can get to articulating what is the “reasonable” view of the challenges of modern terrorism. Though our civilized society can hardly comprehend what passions lay behind arbitrary killing and there is a tendency to want to defeat terrorism through some reasonable set of policies involving righting wrongs and removing impediments towards conciliation, there is also the reality that day-to-day a cycle of terror and response perfectly forms its own symbiotic stimuli, stimuli that itself advances the very cancerous malevolence. This is not to say that the problem of terrorism is unfathomable or insolvable nor that civilized society is condemned to live in a state of constant terror. Yet we do now live in a society increasingly and completely shaped by the existence of terrorism. One cannot travel or transact business without some continuous reminder that terrorism has a global reach and influences almost everything we do. The assumption is as much that someone is plotting as it is that the authorities are ever present in front of and behind the scenes watching and listening to stop them. We are told that if we see something we should say something. That basically means something out of place, a package or a person that doesn’t belong, an outlier who isn’t complacent or anesthetized through the customary appetites of mass entertainment or team spirit. One could get ephemeral here, but let’s be blunt: Living in a terror state means actual changes in the character of government and civil society. The total population is potentially subject to modes of systematic cataloging and monitoring justified as a proactive necessity to find people who don’t want to be like us. One could gloss over the hardest cases and speak of revolutionaries or freedom fighters or just dreamers who want political or social change. And one could promiscuously label every mass murderer or arch criminal as terrorist. Yet while we parse and debate what the situation is and what to do about, while we argue about who is responsible or even who is behind it, while we lament colonial legacies or intractable conflicts, while we decry government fitness or tinker with military strategy, policemen on the block and the soldiers and spies in the field have a job to do. Their quest is never ending. Because whether the number of terrorist attacks this year is on the rise or in decline, whether the lethality of individual incidents is up or down, whether the war is producing desired outcomes or not, whether it’s Spring or Winter somewhere in the world, no one in the world of pondering and punditry can seemingly control what will happen tomorrow, next week or next year. Terrorism is merely a tactic, the critics of the war against terror say; and violent extremists are in the minority in the Islamic (or Jewish or Christian) worlds. Some adhere to the conventional wisdom that killing terrorists merely produces more. What the world needs is: If people would just talk reasonably, if the west would be less interventionist and military force were indeed only used as a last resort, if greater care were taken in minimizing collateral harm to civilians, and if wealth and power were just properly distributed. And if there were more fairness and justice in the world, if everyone just adhered to the universal norms of human rights, if religious zealots were deprived of a pulpit from which to propagate their hate, the allure and the practice of terrorism would decline. And indeed all of those tracks might be appropriate and needed. But what about those who don’t want to be like us, who don’t want to be reasonable, who don’t want to talk or even more, who get their inspirations from GOD? Clearly the majority of Muslims decry violence, but there are also plenty who just don’t want to be a part of a standardized or homogenized one-world that the majority on the north of the planet carelessly build. And though extremism aptly encompasses the very definition of those who refuse to be a part of the mainstream, what separates the majority of international terrorists from say local lawbreakers and what distinguishes a certain group of Muslims from ultra-orthodox Israelis who also refuse to compromise or capitulate to the State is that only Islamic extremists believe that their enemy is the United States itself, or the state of Israel, or the West, or democracy, or even modernism; and thus they justify striking out against all of those things in the name of GOD or as part of a defense of their lives. The vast majority in government and the international community doggedly adhere to the convention that the problem isn’t Islam per se. They voice that the problem is some deviant group or now the latest: that it is “violent extremism” of no religious or ideological rooting. Such a formulation avoids the condemnation of any religion and seemingly preserves an inalienable right to worship freely. But it also somewhat deceptive. Extremism is too vague to accurately describe either the real problem or potential solutions. And it sweeps up those who merely want to exercise another inalienable right – free speech – into a domain of state control and suppression. And the reluctance to say that the prime problem today is violent Islamic extremism makes the fight against “terrorism” scatter into ancillary questions of whether there are sufficient investments in gun control. We could of course digress into a discussion as to whether a lobotomized society and a citizenry powerless against the state isn’t precisely what any government naturally seeks, but that intellectual journey with regard to international terrorism has no tangible destination. International terrorism today constitutes a definable problem set. It takes place mostly in (or originates in) the Muslim world and the vast majority of attacks are perpetrated by Islamist champions. Islam may not be the problem and the world is not officially at war with a religion but something about the religion itself forms the basic substrata. Even if Islamic terrorists are unsanctioned and out of the mainstream, their violence is unique in its influence and global reach. Whether terrorists espouse political, Sunni, or Shi’a justifications for violence, questions are obviously raised regarding Islam’s compatibility with western (and globalized) aesthetics, the role of the religion in civil society, and the international implications of the antagonistic and irreconcilable cleavages within the religion that has existed for hundreds of years. With the attacks of 9/11, all of these problems immediately became matters of international security and stability. There was almost instant and unanimous agreement that al Qaeda, which had found sanctuary in Taliban-led Afghanistan, needed to be eliminated. Fighting commenced, governments’ united, international institutions strengthened; and the laws and norms to contain terrorism gained global support. Though gross mistakes were made in the conduct of that war and correction after correction followed, though new and different war strategies were adapted, and though it took almost a decade for the intelligence and law enforcement organs to learn new ways and sharpen their skills, by 2010 or thereabouts, al Qaeda central, and the threat of an international attack of 9/11 proportions seem to be almost defeated. The “Arab Spring” then breathed new life into governmental reform; it was as if “moderate” Islamic society itself had reached its limit and was starting to address the so-called root causes. But stability was not to be and a half dozen decentralized al Qaeda affiliates had subsequently emerged, each exerting broader influence alongside a growing cluster of non-al Qaeda groups. The so-called Islamic State (commonly referred to as ISIS or ISIL) then started rampaging over the territory of failed states and beyond. Brutal and shocking acts of violence were perpetrated, many seeming to be precisely for the purpose of shocking the civilized aesthetic. There is no denying that more people were killed from terrorist acts in 2014 than ever before, then again in 2015, and now in 2016. In the same year that the United States and its glorious coalition of reason launched its war against the Islamic State in 2014, more worldwide groups were newly designated as foreign terrorist organizations then in any previous year, including 2001. Where just a few years earlier the demise of al Qaeda was seen as spawning “lone wolves” floating leaderless outside a disrupted network, now tens of thousands of foreign fighters, almost half from western countries, were also flocking to the war zone to join the Islamic State. That flow has been disrupted but thousands have returned home, and tens or hundreds of thousands more already are home. The affiliation of terrorism today is as simple as an individual declaration. So terrorism hasn’t been defeated by war. Not even weakened. There is no nation in the Middle East that is more stable today than it was in 2001. An entire generation of Muslim youth has now lived most of their life in a state of war. They have been and continue to be radicalized online, the Internet and social media emerging as the main instruments of terrorist communications, news, ideological dissemination, and recruitment. Terrorism has moved into a new phase, one not dominated by the brotherhood of battle that bonded the Afghan mujahedeen or the Palestinian militant united in a common cause but into a true global jihad, impersonal, dispersed and amorphous. The old al Qaeda survives and State-sponsored terrorism doggedly persists, but the new terrorism is a vastly accelerated and grandiose crusade to conquer the lands of pre-modern Islam, an endeavor that is both possible and absurd but one that helps to clarify exactly what the problem is and what possible answers could be. Every terror extravaganza unfolds in the same way: The act, the shock, the personal testimony of the victims, the news media saturation; government action, over-reaction, assurances and complete obliviousness; security heightened, ever heightened. The partisan voices blame whoever is in office. The racists blame a people. The militarists decry weakness and demand a greater war effort. Then the reasonable start their seminars and commissions to ask what went wrong – for something always did – and the noose tightens, on society, on free speech, on last year’s/month’s/week’s or yesterday’s threat. No one steps outside their allocated and adopted lane in this cycle: The reasonable, the unreasonable, the military, the news media, nor the mob. All along, the scourge and threat of terrorism grows. “They” are winning: admit it. One after another and then another, individuals having outsize impact through random violence. And the world is terrorized. It isn’t the randomness of Nice or Dallas or Brussels or Istanbul that should come as a surprise, nor the willingness of this current generation to break the rules and jump the median in society’s orderly lane to bring violence and death to the most common places. It is the rapidity of all of this that is surprising, that is, if one considers the so-called western army: hundreds of thousands of police, millions in uniform, tens of thousands of “analysts” and experts, the peta-billions of data the intelligence agencies collect. On days like this, for now every day is that day, I feel angry at the cycle and even angrier at the systemic rigidness of how we maintain the lanes in the road. The same voices go on, magnified by social media, dangling the same bait for their consumers. Governments act with their mindless officiousness and pretend understanding, the reasonable fight for a middle ground while the pressures of left and right (whatever they are) increase and almost overlap, crushing out anything that even represents humanity. It happens everywhere and on both sides. It is truly Orwellian. On days like this, it is so easy to point at the pundits or the politicians, and then like clockwork, to punch away at the police, the psychiatrists, the perpetrators, the priests, the pornographers, even the people. I want to decry the brutality. I work to expose government ignorance and incompetence. But what is needed is far more difficult: The enemies of civil society have transformed and adapted to ply their trade while the reasonable curate a remote and mechanical response apropos yesterday’s war. We go round and round through the solutions of better intelligence, better policing, more controls on society, more bombs and even more reasonableness, all the while skirting the reality that extremists might need to be obliterated in a very unreasonable way. They need to be because that is the only way the forces fighting them can stop being the very stimuli for their growth. Isolationism and walls isn’t the answer, but nor is merely addressing “root causes”. Islam isn’t the problem, per se, any more than fundamentalists of any religion are claimed to be representatives of the goodness of their faith. On days like this, I want to pause to think. Pause. Think. Look inside. Search my own conscience. Think. Learn more. Cry. It is as old as man, as old as time, this thing we call war. From the age of 18 when I volunteered to join the U.S. Army to today, I have studied war. I have learned that the only creed that exists to move us forward is to pay attention to the fundamental rules of war. War is the last resort but it is also the only one. But it is only just, can only be justified, if it holds open the possibility, the probability, that through it, both sides can hope for some restoration of peaceful relations. I believe in just war – not for the righteousness of one cause over another, but for the restoration of peaceful relations between peoples. It is a terrible thing, this thing called war. It can indeed be barbaric, but the sweep of history has transformed war undertaken by the state into an efficient forever. And on the other side? It has transformed as well: terrorism is deadlier, dispersed and survivable, a type of war that is now being waged on society. I myself often question the label of war, but war isn’t one immutable thing and what we now wage in contrast to 2001 is too vast to allocate solely to the police. So we are at war, like it or not. And I don’t like it. But if that war demands the obliteration of one side, if that is the only choice to restore peaceful relations, it is indeed terribly unreasonable and tragic. But that is the circumstance we find ourselves in. And that stark objective isn’t some right or left wing possession, nor some pro- or anti-anything. It is merely the reality of the history of the world, of mankind. Who will wage this war I describe? And how will it be fought? Those questions come later. First, we need to recognize and admit that the war we do wage, and the war they wage, isn’t a just war, that it does not leave open a path to reconciliation. Second, we have to understand that our own mechanics and that the lanes we have established are crowded and unclear, that the sound bites are utterly insufficient and insignificant, and that our reasoning behind what we are doing is faulty. So I don’t like it that we are at war, in a state of perpetual war. But more, I don’t like how it is being fought or the cause that it is supposedly advancing. Yes on days like this, I’m tired and traumatized but I can still think clearly: So to me. It’s simple. We need a just war against terrorism. And we need leaders who equally believe that what has passed for reasonable for the past decade and a half is no longer so. That doesn’t mean bombs and more bombs but nor does it mean some reasonableness test for admission to peaceful and civil society with everyone else denied admission. Think. What we are doing isn’t working. We have to struggle to bring dignity to our enemies’ cause, to recognize their humanity however repugnant they may be. If we conclude after that they are just pure evil and that they have no place in society then we need to pull ourselves together and embrace an uncompromising war to better humanity. It won’t be pretty what I’m hinting at. But it is a better path to peace than an unjust and muddled reasonableness that we currently find ourselves in, one that destroys our own society and threatens our own security and freedoms in its ineffectiveness and carelessness. The drive last week to attack Syria for using weapons of mass destruction is an American straight-jacket of the most confining sort. Before President Obama decided to ask Congress to authorize the use of military force, the arguments for and against were flying. Is it legal? Is the intelligence accurate? Do we know the right targets? Can missiles or aircraft overcome supposedly robust Syrian air defenses? Will U.S. military and Syrian civilian lives be spared? Are we really helping the Syrian people? How will the rest of the world react? Can we achieve our objectives? The horror of chemicals, the gassing of innocent civilians, terror weapons; the hyperbole reserved for the evil of weapons of mass destruction is only matched by equally grave phrases — American credibility on the line, catastrophe, World War III — used to describe the costs of action or inaction. That’s the thing with WMD. They hover above every other concern, foreign and domestic. They are a national security trump card accorded a special place befitting being the most coveted and detested of all objects. In close to 40 years I’ve been working on issues relating to the military, I’ve watched this never-ending theater of WMD. Over decades and diverse administrations, justifications for the use of force — limited and full scale — have constantly revolved around weapons of mass destruction. Protection against them, real and imaginary, has served itself as justification for government excess and a curtailment of our freedoms. So much so that even today, from august international bodies that sit on high to the recognized wise that populate academia to human rights activists and even peaceniks, the common mantra is that WMD cannot be tolerated. We stop everything because it is WMD and we fret about the consequences of both action and inaction because it is WMD. We do so because of a little known and little understood entity that truly drives American national security practices: It’s called The Program. Founded in the darkest days of nuclear threat during the Eisenhower administration, The Program began as a limited system given responsibility for survival of the government. The nuclear arms race ended, but The Program never completely went away. And since 9/11, like everything else about national security, its mission and focus has expanded. The main reason again is WMD. An accepted assumption passed down from Clinton to Bush to Obama is that an exceptional threat that once just existed in all-out nuclear war between the United States and the Soviet Union transformed into an everyday threat. And not only that, but in an age of terrorism and global connectedness, WMD manifests not just from foreign regimes or terrorist groups, but also in common components — pressure cookers, a nasty virus, a keyboard — anything that could be the trigger for societal breakdown, even if it comes in the form of natural disasters or just system failures. As the agent of survival, The Program is also the survivor. To conceive of what The Program is, think Wall Street. It is a place, but it is also allusively the entirety of certain interests. It is made up of the equivalent of banks and financial institutions — actual offices in departments and agencies of government; people, policies, objectives — but it is not ruled by one man or entity, yet it acts in unison and with united purpose. It has a nominal headquarters that culminates in the White House but it has become more permanent than the elected who occupy it. And though it is budgeted and the Congress even participates in its workings, it is neither legislated nor publicly sanctioned. The Program exists through a system of sealed envelopes — four dozen formal Presidential Emergency Action Documents more secret than anything that has been revealed about the National Security Agency of late, arrangements that instruct a surviving entity of what to do if a nation-destroying calamity befalls Washington or the United States. Because Doomsday is now thought by the experts in government to be any day, and because the potential battlefield is anyplace and every place, the work of The Program, and its power, has dramatically expanded. A survival apparatus operates behind the scenes as if survival is perpetually and instantly at stake. There’s no overt conspiracy here, unless one considers the supremacy of this impenetrable and unchallenged ideology. Successive presidencies have granted The Program extraordinary powers and extralegal action beyond anything sanctioned in the Constitution or public laws. This is precisely because whatever would activate the need for overt takeover would surely be necessary to preserve or even restore the nation’s institutions and laws. Extraordinary secrecy safeguards The Program, but in an always hyperbolic society where threats redefined as mass destruction are seemingly everywhere, not too many questions are asked. With the discussions that began last week, we will be back again in this cycle, whether it’s with Iran’s WMD or North Korea’s or even al Qaeda’s. At the highest reaches of government, the inherited and ingrained assumption will be that when it comes to WMD violating law to uphold law is allowable, even warranted. And not only that, but because of WMD and the vulnerability of modern society, political compromises and legal violations will be endorsed to prevent or forestall mass destruction. The Program is a subtle American coup that condemns us to perform the same rituals and set down the same red lines oblivious to the stranglehold that this way of thinking and mode of governance has on our nation. If the program were effective at improving our national security, if at the end of any given year the powers that be concluded that they had made progress and could loosen the reins of secret government and return to some state of normalcy, then one might reluctantly agree with the Washington tune that everything is a trade-off between security and freedom. Not only does this never happen, but policies of torture and warrantless surveillance and government assassination of American citizens persist and flourish, our freedoms and values actively undermined in a state of martial life that is both invisible and all-encompassing. For The Program, Syria is just business as usual. It’s not as if the thousands who toil away behind the scenes have an opinion one way or another. Nor are they necessarily pulling any strings. But the business of doing the nation’s dirty work demands a complex web, and the mission to connect the dots to every potential hiding place creates an almost unlimited mandate. What The Program endeavors for is for the American people to get with the program. Fear of mass destruction and the righteous action associated with WMD forms a perfect cushion and shield, survival and sustenance assured for noble purposes. The details emerging about the Eager Lion 12 military exercise in Jordan are almost as scary as the speculation circulating in the press about a Syria (or Iran) mission preparation. Jordan and the United States continue to insist that the exercise has no connection with any real-world events. 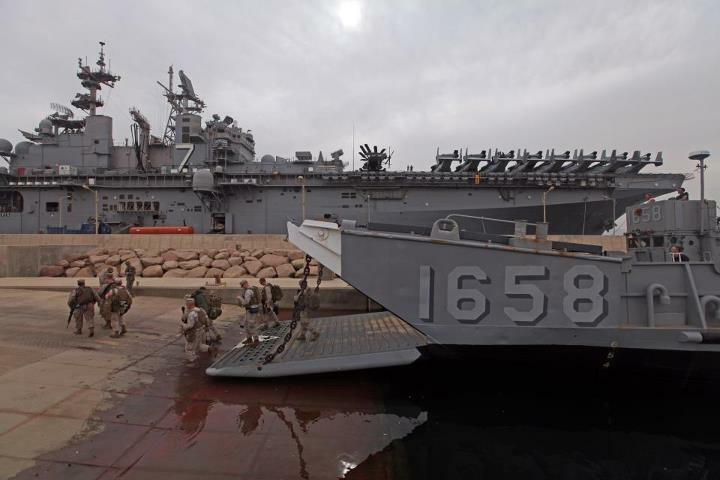 U.S. Central Command (CENTCOM) now says that the exercise is “the largest annual exercise in the Central Command area of operations,” supplanting Bright Star, the exercise series previously conducted in Egypt. I guess the masters of war planning have a lot of faith in the stability and resilience of the Jordanian government, come to think of it, just like they did about Egypt. Eager Lion, which most press reports refer to as including 17 participants, actually includes 19 participants, according to CENTCOM. They include Australia, Bahrain, Brunei, Egypt, France, Italy, Iraq, Jordan, Kingdom of Saudi Arabia, Kuwait, Lebanon, Pakistan, Qatar, Spain, Romania, Ukraine, United Arab Emirates, United Kingdom and United States. The exercise is touted as “building relationships,” but the 19 nations weren’t named until May 15th: I suppose it’s more like a furtive affair than a relationship. It’s interesting to note that Turkey, previously reported as participating, evidently is not; and that Iraq is there. I didn’t even know that there was such a crisis response force, and nothing was reported in the news media when it was deployed in March. The on-scene U.S. commander for Eager Lion 12 is Maj. Gen. Ken Tovo, who in his day job is Commander Special Operations Command Central (SOCCENT) and for the exercise is Commander, Combined Joint Task Force Spartan (CJTF Spartan). Tovo is one of the most talented officers in our Army’s senior ranks and clearly is one of our nation’s Special Operations Forces’ superstars,” CIA Director David Petraeus said in an email to the Tampa Tribune. There’s an odd hit job on Tovo on Examiner.com, as if anything is actually known about the man.